Move over parrots, there's a new animal on the dance floor. Her name is Ronan, and she's a California sea lion at Long Marine Laboratory at the University of California, Santa Cruz. Scientists at the lab trained Ronan to bob her head in time with rhythmic sounds, then showed that she could transfer this skill to tempos and music she hadn't heard before. Ronan is the first non-human mammal convincingly shown to be able to keep the beat. Scientists call it "rhythmic entrainment," and aside from humans it was previously seen only in parrots and other birds with a talent for vocal mimicry. Ronan's sense of rhythm undercuts an increasingly influential theory that beat keeping requires a capacity for complex vocal learning, according to Peter Cook, a graduate student in psychology at UC Santa Cruz and first author of the study, published online April 1, 2013 in the Journal of Comparative Psychology. Sea lions have limited flexibility in the sounds they make, and they are not known to be capable of vocal mimicry. "Ronan's success poses a real problem for the theory that vocal mimicry is a necessary precondition for rhythmic entrainment," Cook said. That theory had gained support from two 2009 studies inspired by a sulfur-crested cockatoo named Snowball, who became an Internet sensation after his owner posted a video of Snowball dancing to the Backstreet Boys. Researchers intrigued by the video had conducted a rigorous search for more dancing-animal videos and found that, at least on YouTube, parrots and their relatives accounted for almost every apparent case of beat keeping. "The idea was that beat keeping is a fortuitous side effect of adaptations for vocal mimicry, which requires matching incoming auditory signals with outgoing vocal behavior," Cook said. "It's understandable why that theory was attractive. But the fact is our sea lion has gotten really good at keeping the beat. Our finding represents a cautionary note for an idea that was really starting to take hold in the field of comparative psychology." Born in the wild in 2008, Ronan was rescued by the Marine Mammal Center in Sausalito in 2009 after she was found on Highway 1 in San Luis Obispo County. It was her third stranding incident, and she didn't seem to be making it in the wild. She came to Long Marine Lab in January 2010 and joined the Pinniped Cognition and Sensory Systems Laboratory directed by one of Cook's advisers at UCSC, animal behaviorist Colleen Reichmuth. At first, the beat-keeping study was a side project for both Ronan and Cook. Ronan had originally served as a healthy control in Cook's primary research project, which focuses on the cognitive effects of a neurotoxin produced by certain algae found along the California coast. During blooms of the algae, the toxin enters the food chain and sometimes causes mass strandings of sea lions. Many of the affected animals end up at the Marine Mammal Center for rehabilitation, where Cook collaborates with the staff to study the effects of the neurotoxin, using a mixture of brain imaging and behavioral approaches. The idea to use Ronan in a study of beat keeping was spurred partly by her facility for rapid learning. "From my first interactions with her, it was clear that Ronan was a particularly bright sea lion," Cook said. "Everybody in the animal cognition world, including me, was intrigued by the dancing bird studies, but I remember thinking that no one had attempted a strong effort to show beat keeping in an animal other than a parrot. I figured training a mammal to move in time to music would be hard, but Ronan seemed like an ideal subject." Working mostly on weekends, Cook and research technician Andrew Rouse began training Ronan to bob her head to a beat, starting with simple rhythm tracks. It took a few months before she was reliably keeping the beat, but once she had mastered it, Ronan showed a remarkable ability to keep time to novel rhythmic tempos and music. Currently, her favorite track seems to be Earth Wind & Fire's "Boogie Wonderland." "Given her success at keeping the beat with new rhythm tracks and songs following her initial training, it's possible that keeping the beat isn't that hard for her," Cook said. "She just had to learn what it was we wanted her to do." Although parrots may show a greater inclination for this behavior without explicit training, Cook noted that it is not clear whether birds like Snowball started dancing spontaneously. Cockatoos and other parrots are long-lived, highly social birds known to bond closely with their human keepers. "Some of these parrots are not intentionally trained, but they do have decades of complex interaction with humans," he said. Cook also noted that the well-trained Ronan performs much better than the birds at staying on the beat. "In the videos, Alex [an African gray parrot] and Snowball fall off the beat a lot. They’re good at finding the tempo in music, but don’t seem to maintain the behavior as reliably as Ronan. She stays right on the beat," he said. Cook is working with Margaret Wilson, an associate professor of psychology at UC Santa Cruz, to explore the implications of the new findings. Scientists once thought that the underpinnings of musical ability were unique to humans. The recent demonstrations of entrainment in parrots have challenged that, but only in a limited way, leading to the idea that specializations for vocal mimicry might be necessary for the ability to move in time with a heard rhythm. This theory cannot, however, account for beat keeping in Ronan, a non-mimic. Wilson and Cook argue that the brain mechanisms needed for beat keeping may be widespread in the animal kingdom. "Human musical ability may in fact have foundations that are shared with animals," Cook said. "People have assumed that animals lack these abilities. In some cases, people just hadn't looked." Cook, Rouse, Wilson, and Reichmuth are all coauthors of the new paper. 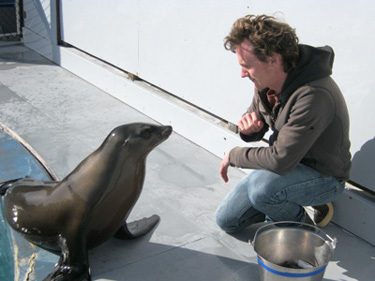 Rouse was a UCSC undergraduate when he began working at the Pinniped Lab, earning a B.S. in biology in 2011. This research was supported by an award from the Packard Endowment for Ocean Sciences at UCSC and a National Science Foundation Graduate Student Fellowship to Peter Cook. The Pinniped Lab works with Ronan under National Marine Fisheries Service permit #14535.